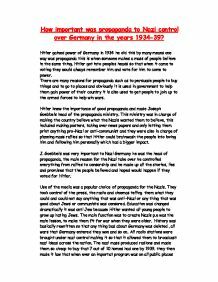 Hitler gained power of Germany in 1934 he did this by many means one way was propaganda this is when someone makes a mass of people believe in the same thing. Hitler got into peoples heads so that when it came to voting they would always remember him and vote for him to come to power. There are many reasons for propaganda such as to persuade people to buy things and to go to places and obviously it is used in government to help them gain power of their country it is also used to get people to join up to the armed forces to help win wars. Hitler knew the importance of good propaganda and made Joseph Goebbels head of the propaganda ministry. This ministry was in charge of making the country believe what the Nazis wanted them to believe, this included making posters, taking over news papers and only letting them print anything pro-Nazi or anti-communist and they were also in charge of planning mass rallies so that Hitler could brainwash the people into loving him and following him personally which had a bigger impact. J. Goebbels was very important to Nazi Germany he was the head of propaganda, the main reason for the Nazi take over he controlled everything from rallies to censorship and he made up all the stories, lies and promises that the people believed and hoped would happen if they voted for Hitler. Use of the media was a popular choice of propaganda for the Nazis. They took control of the press, the radio and cinemas telling them what they could and could not say anything that was anti-Nazi or any thing that was good about Jews or communists was censored. Education was changed dramatically it was anti Jew because Hitler wanted all young people to grow up hating Jews. The main function was to create Nazis p.e was the main lesson, to make them fit for war when they were older. History was basically rewritten so that any thing bad about Germany was deleted, all wars that Germany entered they won and so on. All radio stations were brought under nazi control making it so that it allowed them to broadcast nazi ideas across the nation. The nazi mass produced radions and made them so cheap to buy that 7 out of 10 homes had one by 1939. they then made it law that when ever an importat program was on all public places had to put ther radios on. In 1038 loud speakers were put on lampposts so that were ever you was you could always hear the Nazis. Goebbels used rallies to round millions of people into an ecstasy of belief of the power of Hitler and the Nazi party and to increase loyalty to the party. Each year a mass rally at Nuremburg brought together hundreds of thousand of people for parades and displays in huge arenas. They used slogans so that people remembered the Nazis so that it could be seen by a mass of people like the rallies. They created single pot Sundays which people were expected to take part in this is were every Sunday when family’s made Sunday lunch they were to make it in one pot and give the money saved to collectors that came in the afternoon. They twisted the truth and told huge lies to fit what they wanted the people to know e.g. the Reichstag fire story. They had no proof it was Van Der Lubbe who set fire to it other than he was in the building at the time, but because he was a communist he was blamed and Hitler made a story up of him setting the fire. Censorship was also used. They took over newspapers and radios, burnt books and films and only allowed the public 2 read watch or listen to anything that celebrated Nazis, German history and/or put the Jews, communists, gypsies, disabled people or anyone against the Nazis, down. The Nazi Germans targeted lots of different types of people with propaganda from single women to young people he promised a there would be a Aryan man for every woman so that they could produce the perfect race he made camps for kid the boys went to Hitler youth and the girls went to the league of German maidens. The boys were basically taught how to be soldiers and to live life at war and the girls were taught how to be family carers and housewives. They were used in parades and marched around streets of Germany. They were trained how to use guns and to hate Jews. I t became law that all young people old enough had to join in 1939.hitler youth and the league of German maidens was considered to be more important than school. They targeted the Jews with there propaganda also, by telling non-Jews to hate them and making Jews outcasts. They drew posters and cartoons of them and making them look like ugly beasts and telling everyone it was there fault they lost the 1st world war and that they were to rich and did nothing to earn it. There were many new laws passed in Germany for example the law against malicious gossip. This stopped people talking badly of Hitler and the Nazi party. People became careful of what they talked about and became scared that they were being listened to and kept their thoughts quiet. There was the law that made all Jews register there religion an wear the Star of David so that people recognised them in the street and when it came to the holocaust it became very hard for them to hide because the Nazis already knew were they lived and worked. The Nazis also used terror to help them gain control by putting fear into people. They had public hangings of people who stood up to Nazis and said anything against them. He got rid off the freedoms of speech, privacy and the right to be in groups. The Nazis had the power to listen to people’s phone calls invade peoples houses without a warrant and read peoples mail if they wanted to. Hitler also created the SA also known as the brown shirts. These were called in if the ordinary police weren’t getting anywhere or if the Nazis wanted people killed or beaten up. The fear of the SA pressured people Germans who did not support the Nazis into silence. The SS was Hitler’s own bodyguard service and army. It was controlled by Heinrich Himmler. They controlled concentration and death camps. The SS carried out the enslavement, torture and killing of about twelve million people. Most victims were Jews but a large number of victims included racial groups such as the Soviets and Gypsies. They were basically in charge of the racial purism battle. Concentration camps were places were the holocaust began to take place. Horrible conditions little food and over working were the main reason for deaths of millions of prisoners. Forced to work all day in filthy conditions with bred and water to keep them going made them so weak that most just died or gave up and stood up to a guard so that they got shot because they did not want to live anymore. Hitler believed it the one leader concept and once he came to power made Germany a totalitarian state, he took out all opponents and made himself leader of the country he had total control over every state in Germany all laws applied to everywhere and no one could appose him. Hitler occupied others parties offices stopping them from meeting so that they couldn’t some up with plans and took funds from them so they couldn’t afford anything leaving them defenseless against Hitler as they had no way of doing anything, it made them weak. Hitler wanted to tackle mass un-employment he hated the fact that Germany was so poor. He wanted to get Germany out of world recession, he promised to solve unemployment, make Germany self-sufficient so that they didn’t have to go to other countries for help, and get rid of all Jew industries and give them to his master race (Aryans). He then used Germany’s new money to rebuild his armies and rearm Germany ready for war. I think that propaganda was not the reason that Hitler was able to keep control because even though it was always around pressuring people to doing as Hitler said I think that terror played a bigger part in it as without the fear of the SS or SA knocking on your door at night people would of stood up to Hitler and there would have been so many people doing it that it would have been harder for Hitler to keep control and I also think there would have been more assassination attempts on him because they wouldn’t of been scared of getting killed or taken to a concentration camps. Hitler would have found it difficult without scaring people but I think that propaganda did help a bit because it kept people on his side for a bit before he could really get the terror going. 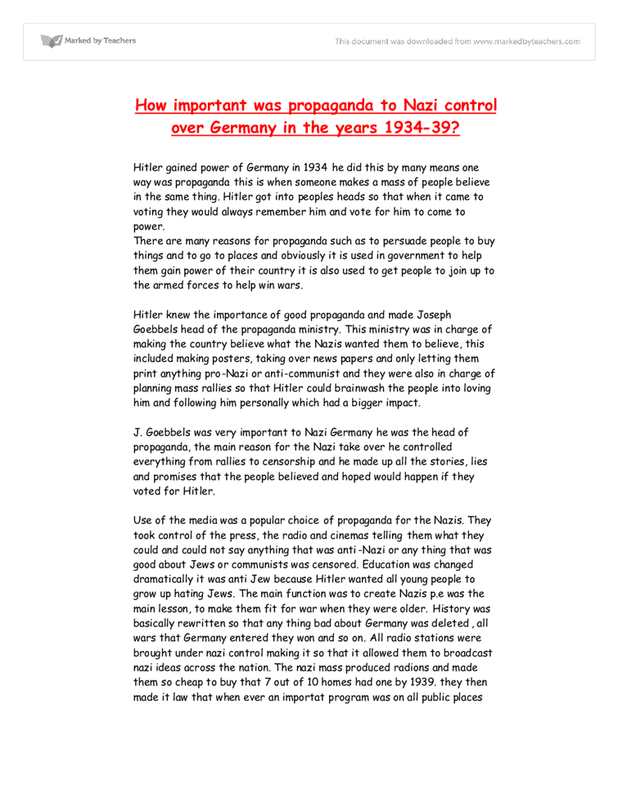 Why Was Propaganda Important To Hitler's Control Over Germany? How important was Goebbels both in the Nazi Party and in Nazi Germany? were banned from further education. This was the most vital change in curriculum, however, was the change in the teaching if German Culture, History and Biology. The pupils were made extremely aware of their cultural heritage, and stress the idea of the 'Volk'. History lessons were filtered and consisted mainly of the Nazi revolution. were made to pay a fine of a thousand million marks for the damage. The fine was raised by confiscating 20 per cent of the property of each Jew. A decree to this effect was promulgated on November 12, and on November 15 Jewish children were formally forbidden to attend German schools. These subjects included the inferiority of Jews and German expansion into Eastern Europe. Through all of his work Geobbels was supported by the SS and the Gestapo. If he wanted to close down an anti-Nazi newspaper, silence an anti-Nazi writer or catch someone listening to a foreign radio station, they were on hand to help Geobbels. Hitler also created 'elite' schools where the future nazi leaders were prepared to govern. click to see bigger But Hitler needed an organisation that would be seperate from schools and therefore more attractive and effective. The Hitler youth had therefore the task of indoctrinating young people. -Hitler attempted to seize power in Bavaria (the ?Beer Hall Putsch? ), aiming to march on Berlin and overthrow the Weimar Republic. The attempt failed, Hitler was arrested and imprisoned. -Hindenburg was elected President of Germany. 1926 -General strike in Britain and much labour unrest.